Never seen a UFO? It’s all because nobody caught a real one on tape but that is now a thing from the past as this t-shirt shows a UFO caught on tape. OK it’s not film it is a UFO on a piece of tape that came from your tape dispenser. 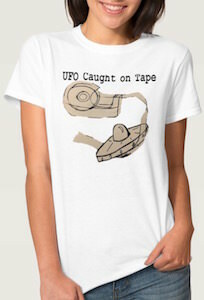 Yes it’s funny for sure as it even says “UFO caught on tape” on the shirt with an image of the flying saucer and some tape. You can get this UFO t-shirt in many women’s styles and sizes and yes you can even pick a different fun color to. Are you looking to incorporate your chilhood with a Christmas splash using a clever idea. 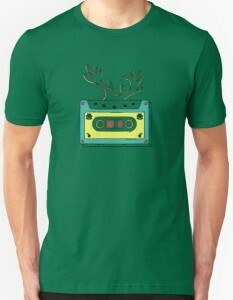 This is a t-shirt that has one of those old school cassette tapes that we use to be how we listened to music. The cassette tape has all of the tape sticking out of it in a clever way. The tape is shaped like the antlers of a reindeer how fun is that for the holiday season of Christmas. Available in a wide selection of unisex sizes that range from Small to 3XL. Choose from a great variety of 18 different fun vibrant and unique shirt colors. Not everyone will remember cassette tapes, but if you are, you probably have fond memories of waiting for your favorite song on the radio and pressing record over and over to create the perfect mix tape. 1962 – 1992 are the years found on this t-shirt depicting the life span of a compact cassette tape. 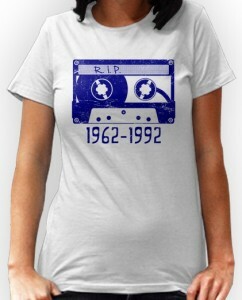 This t-shirt also has a picture of a cassette tape with the memo “R.I.P”. Rest in peace cassette tape, rest in peace. This t-shirt comes in women and men’s sizes from Small to 3XL. It comes in a number of colors that you can choose from to make it your own and is made from soft, pre-shrunk 100% cotton. 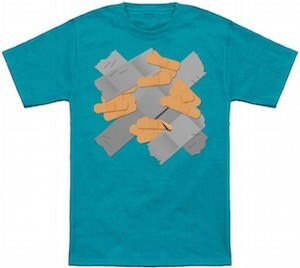 Your new favorite t-shirt is the No More Cassette Tape T-Shirt. Remember the days that you mixed your own cassette tapes? Yes that was so in the 80’s and that could mean that your body is getting older but in your mind you are still young and deserve to show the world how cool your where in those times. 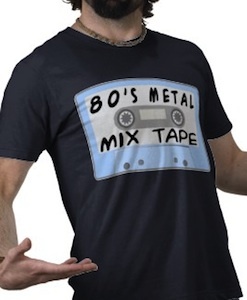 This t-shirt shows a tape and on that tape it says “80’s Metal Mix Tape” just like you did that time in the past. Be cool again with this 80’s Mix Tape T-Shirt.